On May 23, 2018, deputies with Constable Mark Herman’s Office responded to the 21500 block of Amesbury Meadow Lane in reference to a suspicious vehicle. 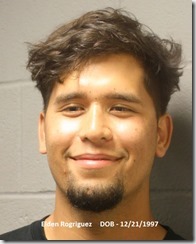 Constable Deputies located the vehicle and during the course of the investigation located 8.13 ounces of Marijuana and 3.8 grams of Tetrahydrocannabinol wax. The driver of the vehicle was identified as Elden Rodriguez, who informed deputies that the contraband belonged to him. “Elden Rodriguez was arrested and booked into the Harris County Jail, charged with Manufacture/Delivery of a Controlled Substance. His bond was set at $10,000.00 out of the 178th District Court.” – Constable Mark Herman.